Let me be clear. I thought there was going to be an actual dog in Milwaukee Chamber Theatre’s production of “Chapatti,” by Christian O’Reilly. The scruffy pooch was featured in all the ads. He’s even on the cover of the program. This storytelling technique — which is employed expertly by both the playwright and the production’s two actors — makes “Chapatti” an unusual and thoroughly enchanting play. 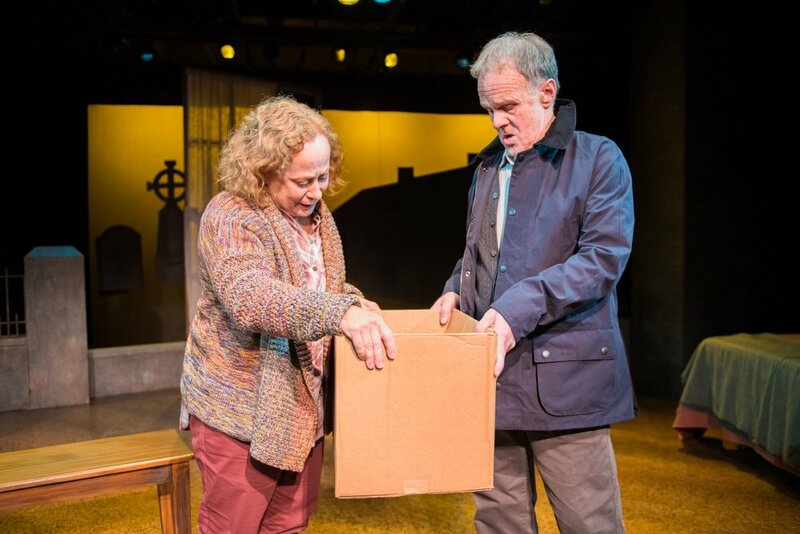 Through many long monologues directed to the audience, we are privy to the inner thoughts of both Dan and his neighbor Betty (Jenny Wanasek), their perspectives on their surroundings, and each other. We also see them interact occasionally with one another through traditional dialogue. For lonely, isolated people with no family but their pets, little connection with others, the specter of friends’ deaths haunting them both, and a lifetime of large and small disappointments, this confessional style works brilliantly — so much better, in fact, than trying to shoehorn decades of back story into exposition. It’s an easy and gentle way for us to get to know Dan and Betty, as if we were trusted acquaintances, listening to old friends tell the stories that they need to tell someone. Cast in the role of their lifelines, the audience is immediately drawn in to a tale we think we already know, about older people finding a new friendship when many of their loved ones are gone. That initial ease makes the hard left turns in the story even more jarring, but it also makes us determined to hang on, and follow their odyssey to the end — which also provides a sudden, unexpected jolt. Photo by Paul Ruffolo, featuring James Tasse as Dan, and Jenny Wanasek as Betty. As the weathered and mourning Dan, James Tasse presents a very practical view of a man who feels he’s outlasted his usefulness, and that his flat is just too dark to bear without his beloved Martha in it. Tasse’s elastic face and sharp intakes of breath contain all the complicated details of Dan’s plans and missteps as he ponders what to do now that he and Chapatti are on their own. And because Tasse so clearly sees an old photo of Dan and Martha camping together, we see it too, though there’s no photo on the set. As a more rational variation of a crazy cat lady, Jenny Wanasek’s Betty is also very grounded. She looks for simple ways to encourage her invalid and grumpy neighbor to make the best of her old age and impaired state, just as she consoles herself with a houseful of friendly, independent, self assured cats to make up for the lack of love she found in her marriage. Wanasek laughs loudly and easily and mostly puts a brave face on each of Betty’s less than ideal situations, ready with a cup to tea to mend all ills. And that makes her naked vulnerability toward the play’s end simply shattering. Director Lopez-Rios sets a nice pace for the 90-minute show and lets the seriousness of the story seep in, while never allowing the characters to wallow in despair. Though it’s punctuated with moments of humour and lots of cat versus dog ideology, the serious throughline isn’t obscured; instead the characters are more layered. The simple set, designed by Sandra J. Strawn, works well for the most part. Building corners at the edges of the stage give the feeling that the main characters’ lives are being hemmed in by progress — that they are being forced into smaller and smaller spaces. But flat cut-outs of a traditional Irish country house and gravestones suspended upstage feel like overkill. If we can imagine Betty dropping her box of kittens at the veterinarian’s office with Chapatti and the other dogs going berserk, we can surely imagine a graveyard. But that’s a small complaint about a lovely production of a surprising and heartfelt play, which should appeal equally to cat and dog people, even though no furry cast members actually make an appearance onstage.